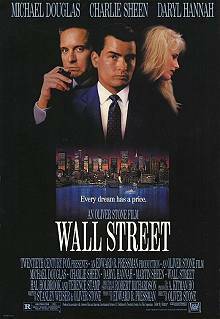 Bud Fox (Charlie Sheen) is a stockbroker. He's stuck in the bull pen making cold calls selling weak stock to minor investors. He dreams of landing a big fish, and he has chosen Gordon Gekko (Michael Douglas). He tries everything to win a moment with Gekko and when he gets it and is challenged to come up with something good, he reveals a bit of insider information from his father (Martin Sheen). Bud Fox is on his way. Gekko takes him under his wing and introduces him to the world of insider trading and corporate espionage. Gekko introduces Bud to Darien Taylor (Daryl Hannah) and she introduces Bud to conspicuous spending. An expensive apartment, lavish edging decorating, and bigger dreams. For Bud and the friends he uses to create the protective layers around Gekko, it's the ride of their life. But Bud is going to learn that where money is made without product, it's also made without conscience. He must learn that his behaviour has consequences and decide what he is going to do about it. The parties, the clothes, the hot girlfriend all come at a cost and ultimately Bud must decide if he's willing to pay it.